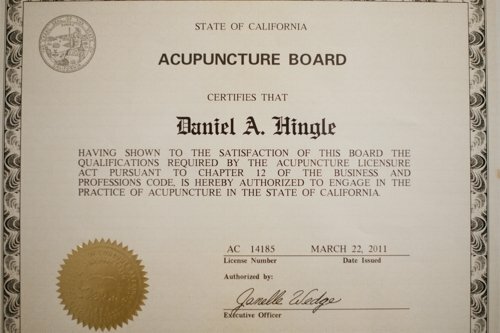 I, Dan Hingle, solemnly promise, as a practitioner to perform my profession to the best of my ability. I use my knowledge and skill to aid in the prevention and treatment of diseases, and to promote wellness and well being. I will help my patients understand the causes of their disease, the treatment process and the prognosis. I will encourage my patients to participate in decisions relating to their health. I will strive to alleviate my patients’ fears, and recognize that an important part of the treatment is to listen with kindness and understanding to speak to with compassion and honesty. I will treat my patients with dignity and will give to them the respect and privacy I would hope to receive if I were ill. I will keep their trust and preserve their confidentiality. I will respect the wisdom of my teachers and will share the knowledge with others. I will strive to develop my medical skills and bedside manner. I will be modest enough to seek assistance when my treatment seems less than effective. I will cooperate with all others involved in the care of my patients, remembering that the welfare of the patient comes first. I will practice medicine for the benefit of my community, for I see my ability to be a good health care provider as a gift to be shared with my community.